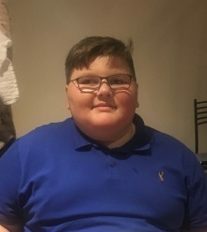 Interests - Mason loves his iPad and playing games and listening to music on there, he has started having a bath and loves lush bath bombs boy smelling ones lol Mason loves fast cars, motorbikes and camper vans Mason has found a great passion in cooking and really enjoys this. 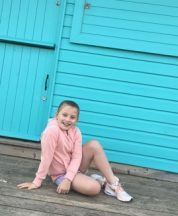 Scarlett is still the enjoying majorettes and now doing theatre lessons on the weekend plus dance. 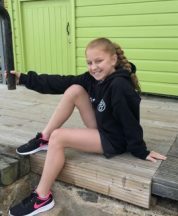 Scarlett likes slime, make up and music. She loves watching make up tutorials and you tubers. Scarlett loves Disney unicorns and anything pink and girly. Mason was diagnosed with a brain tumour in April 2010. Since then he has endured several operations and over two years of chemo. In April 2015, Mason and his family went to America for proton treatment. We have just found out that this hasn’t worked and Mason’s tumour is terminal. Mason’s mobility and eyesight have become worse over the years. Mason sleeps a lot now and his short term memory has been affected by the proton therapy. Mason now has seizures and is on a lot of medication. 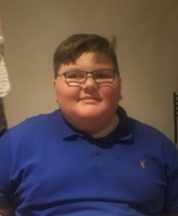 Mason has been through a lot over the six years he has been ill.
Mason has been struggling with seizures and was very poorly before Christmas. He’s finally starting to regain some strength and having a few better days. We have an upcoming MRI and appointments to discuss things further. Mason had surgery yesterday on his eye, he had to stay in hospital due to his haemophilia and needing factors to help with the clotting. We have an MRI coming up in November and this will determine what the plan is next. Mason has been loving his post he has had. He is really liking speedway, police interception and listening to music. He had some amazing Ed Sheeran tickets for his birthday, so he’s extremely excited for this. Mason has nearly completed the whole 18 months of chemo. He has managed a few full days at school. Mason has some pretty rubbish days due to mobility and seizures. Mason is currently on chemo. He is struggling with this and finding it very tiring. His moods aren’t great and doesn’t get to do much as he tires very easily. We have been in Addenbrookes since last night. Mason had a bleed on the brain again and a large cystic growth so that’s the reason why he’s been so poorly. Mason will undergo brain surgery first thing in the morning. Please keep Mason in your thoughts whilst he goes through all this and the recovery process. Mason is pretty much the same, we have been trying to control the seizures and are struggling with getting the right mixture of medicines. Mason has been attending his new special needs school more and enjoying swimming at school. Masons mobility still isn’t great and he’s still having issues with his vision. He’s plodding along, he sleeps a lot now due to seizures medications and the tumour.